Landsman v. Dryden Mut. Ins. Co.
A "named peril" property insurance policy is one that provides coverage only for direct physical loss or damage caused by perils or "causes of loss" the policy specifically enumerates or lists. 17. Freezing of Plumbing, Heating, Air Conditioning Systems, Automatic Fire Protective Sprinkler Systems or Domestic Appliances - excepting loss or damage on the insured premises while the residence is vacant, unoccupied or being constructed. We do cover such loss or damage if an insured has used reasonable care to maintain heat in the residence or to shut off all water and to completely drain the system and domestic appliances. Notice that three things are at work in that one provision: what's covered, not covered, and covered again. 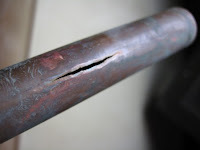 Direct physical loss or damage caused by the freezing of a plumbing, heating or air conditioning system, automatic fire protective sprinkler system or a domestic appliance is covered UNLESS the residence is vacant, unoccupied or being constructed UNLESS the insured has used reasonable care EITHER to maintain heat in the residence OR to shut off all water AND completely drain the system and domestic appliances. In other words, an insured residence's vacant, unoccupied or under construction condition will not negate the freezing peril if the insured has used "reasonable care" either to maintain the residence's heat or to drain the residence's plumbing system and appliances. In the Buffalo, New York area, where I live, each each winter brings its share of frozen and burst water pipe damage claims to insurers. The appearance of these claims after the deep freeze and thaw cycles of our Buffalo winters (which are cold, but not as snowy as stereotypically thought), coupled with a sizeable stock of old, poorly insulated dwellings in Western New York, is so predictable that I've developed a ready-reach digest of reported New York cases of what constitutes "reasonable care to maintain heat" for those insurers facing what usually are sizeable claims, due to fact that once they thaw, burst water pipes frequently remain undiscovered for lengthy periods of time in vacant or unoccupied dwellings. Hence, one can, or at least should, understand the underwriting logic of the exception of freezing coverage for loss or damage to dwellings that are vacant, unoccupied or under construction. Imagine that you own a one-family farmhouse that you rent in upstate New York (which, growing up in northern New Jersey and then Stony Point, Rockland County, I once thought meant anything north of the Tappan Zee Bridge). Upstate in bucolic Hancock, New York, to be precise. In addition to their monthly rent, your tenants are responsible for their own utilities. In September and October, your tenants fall behind on their rent payments, so you commence a summary eviction proceeding against them in November. In late January, you receive a voice message from one of your two tenants, complaining that there was a problem with the furnace at the property. On Sunday, January 30th, you take the two-hour-and-40-minute drive up Route 17 from your home in New York City to the property. No one is home, but you can see items of personal property within the dwelling when you visit the property on that Sunday and the following day. Later on Monday, January 31st, you make the long drive back to your home in New York City. The temperature that day in nearby Monticello, New York, ranged from a low of 5 °F to a high of 32 °F. The normal temperature ranges for Hancock, New York, on January 31st are 14 °F to 28 °F. Upon returning home, you find a telephone message waiting for you from New York State Electric and Gas indicating that the power at the property had been turned off for nonpayment. You try to reach your tenants again by telephone but to no avail. You call NYSEG and ask that the power to the farmhouse be restored under your name, but NYSEG tells you that since the power had been turned off at the pole, it could not be turned back on without an inspection of the interior of the property. Having just returned, you decide not to make the long drive back to the property to provide NYSEG access into the house, thinking in part that the warrant of eviction was being processed by the local town court. The warrant of eviction is issued on February 1st, directing that the "eviction is to occur on the earliest possible date after February 4[th]". On February 5th, you drive back upstate to the property to inspect it and again find some personal property within the house that you assume belonged to your former tenants. You show the house to a prospective new tenant, who rents it and takes possession on February 17th. Once the heat and utilities are restored to the house, however, the new tenants immediately report damaged pipes and leaking from various fixtures in the property. It becomes clear that the pipes froze sometime between January 31st, when NYSEG turned off the power, and February 17th. You immediately notify your insurance company of the water damage and make a claim under your policy. Your insurer retains an independent adjuster, who inspects the damage, and concludes in his reports that the damage was due to freezing pipes. The adjuster also notes his opinion that it would have been impossible to occupy the premises after the utilities were turned off on January 31st, given the cold temperatures in February, and that the pipes likely froze within a day or two of that termination date. On May 10th, your property insurer sends a letter denying coverage, citing paragraph 17 of your policy and stating that its "investigation has shown that proper heat was not maintained in this property and was the ultimate cause of the freezing of pipes and water damage[.]" Being a Manhattan-based attorney who practices real estate litigation, you sue both your insurer and the independent adjuster in New York County Supreme Court. The venue of your action is changed on motion to Broome County Supreme, and you eventually agree to discontinue your suit against the independent adjuster and the related tortious interference with contract cause of action of your complaint. The court denies your insurer's motion for summary judgment, but does dismiss your complaint's third cause of action alleging deceptive business acts and practices, leaving only your breach of contract claim to proceed to a non-jury trial against your insurer, which it does on June 8, 2009. Initially, based upon the credible proof at trial, the court finds that the property damage at issue was caused by freezing pipes at the Property after NYSEG turned off power on January 31, 2005. Thus, the court finds that two questions are presented for resolution under the terms of paragraph 17 of the Policy. First, was the Property vacant and unoccupied which would allow defendant to deny coverage. Second, did the insured use "reasonable care to maintain heat in the residence or to shut off all water and to completely drain the system and domestic appliances." If so, then coverage may not be denied on the basis that the Property was vacant and unoccupied. The court finds that the burden of proof shifts to defendant on these questions. With respect to the question of whether the Property was vacant and unoccupied, the proof establishes that the Property was vacant and unoccupied as of January 31, 2005. Plaintiff had commenced eviction proceedings against Curry and Colwell which culminated in a Warrant of Eviction and Final Judgment ordering Curry and Colwell to be evicted as of February 4, 2005. Curry and Colwell never responded to plaintiff's subsequent phone calls attempting to finalize the settlement. In short, plaintiff knew the eviction was effective on February 4, 2005 and the settlement never finalized. Further, plaintiff visited the Property on January 30 and 31, 2005 and did not see either Curry and Colwell. Plaintiff's decision not to enter the Property for further investigation was misguided in view of the lease which allows the landlord entry for inspection purposes (Pl Ex 3, ¶ 15). Most importantly, however, plaintiff was on notice from NYSEG that the utilities to the Property were terminated as of January 31, 2005. In this court's view, plaintiff could not have reasonably believed that Curry and Colwell were residing in the Property in the dead of winter without heat after the utilities were turned off on January 31, 2005. Consequently, the court finds that defendant properly deemed the Property to be vacant and unoccupied at the time of the loss. The next question is whether defendant properly found that plaintiff did not use "reasonable care to maintain heat in the residence or to shut off all water and to completely drain the system and domestic appliances". Again, the facts elicited at trial answer the question. As noted hereinabove, plaintiff knew on January 31, 2005, in the dead of an upstate New York winter, that there was no heat or electric utility to the Property and did not return to the Property that day or the next. In and of itself, the court finds this knowledge on behalf of plaintiff to be a basis for concluding that plaintiff did not use reasonable care to maintain heat in the Property. Plaintiff's argument that he could not access the Property because Curry and Colwell had until February 4, 2005 to vacate is unpersuasive. As noted above, there was no reasonable basis for plaintiff to believe that Curry and Colwell were in the Property since they had never finalized the settlement agreement and were not present at the Property on either January 30 or 31, 2005. Q: You didn't make arrangements to go have NYSEG turn it [the power] on. A: I did. They said no - - I said, put it on in my name. Q: They said we'll do it if you are there to let us in. And you wouldn't drive up there to let them in. A: I was just there. Based on the credible evidence and documentary proof submitted, the court is satisfied that defendant has met their burden of proof that the Property was vacant and unoccupied at the time of this loss and that plaintiff failed to use reasonable care to maintain heat in the residence or to shut off all water and to completely drain the system and domestic appliances. Does anyone other than me think that plaintiff's occupation and line of work may have factored into the court's decision? Is the standard of reasonable care to maintain heat in a rented property higher for an attorney who practices real estate law and litigation than for an average property owner? Justice Lebous did reject plaintiff's argument that he could not enter the property until February 4th, citing lease provisions giving plaintiff that right. He also seemed bothered by the insured's deliberate decision not to drive back to the property "in the dead of an upstate New York winter" to restore power to the dwelling. This is one of the few issues that arise under property insurance policies in which a subjective rather than objective standard -- reasonable care -- controls the coverage outcome. Consequently, these claims can be more difficult than usual to decide and generally involve questions of fact, precluding summary judgment if a denial issues and litigation ensues. Key to successfully defending "failure to use reasonable care" coverage denials of freezing losses is good, pre-denial investigation. Insurers should not overlook the opportunity to exercise their right to request documents and conduct an examination under oath of their insureds if the claim warrants doing so. To avoid disputes over the cause of such losses, insurers should also take possession of and preserve any burst piping, if it is still available at the time the loss is reported, or insist that the insured do so. The discussion of when a residence may be considered "vacant" (stuff), "unoccupied" (people) or "being constructed" within the meaning of the freezing peril's exception is for another day and another post.